23 oz. Proud Mary Bloody A charbroiled smokey prawn skewer with Andouille sausage, cube of pepper jack cheese, olive, pepperoncini and lemon, red onion & grape tomato. Served with a crispy garlic breadstick, double shot of our house-infused pepper vodka. Fresh spinach, asparagus, jalapeÃ±os, scallions, and Gruyere cheese in a three-egg omelet topped with avocado. Why Should Dinner Have All the Fun? We have dinner-delicious ingredients on a breakfast plate! The Vic is proud to be voted Bend's favorite breakfast place over 15 times and for over 30 years! With six rotating specials, a cozy atmosphere, and plenty of outdoor seating, breakfast becomes the event at The Vic. Fresh ingredients. Homemade hollandaise. Insanely creative combinations. It's breakfast, but better! Three thick slices of Graham cracker crusted, egg grilled, Big Edâ€™s Texas toast. Topped with our homemade caramel sauce, fresh sliced granny smith apples, and whipped cream. Celebrating over 30 years of Breakfasts worth waiting for! 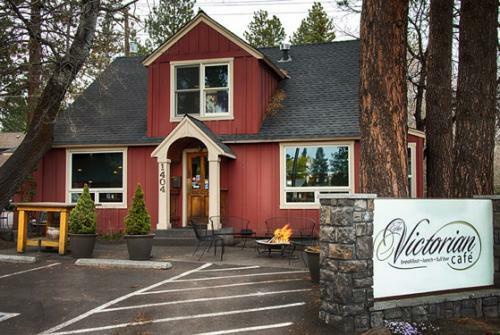 The Victorian Cafe was recently named Best Brunch in Bend Oregon by Central Oregon magazine! Thank you to all of our loyal customers who know we are worth the westside wait! Voted #1 Breakfast in Bend OR 15 Times by The People of Bend! For those of you have not had the "Vic Experience", come see what all the excitement is about! The wait maybe long, but we make it comfortable with lots of outdoor seating, a fire pit, and even an outdoor bar during our busy days so you can sip on a spiked hot chocolate while waiting. Inside, you will see The Victorian Cafe has reinvented the idea of breakfast, putting a modern spin on traditional food fare and embracing the idea that morning dining should be an "experience". Our menus fuse classic breakfast items with creative food combinations that will twist your tastebuds into an unforgetable experience with each bite of our mouth-watering omelets and eggs benedicts. The result is delicious array of brunch offerings that break-free of the breakfast stereotype! The Victorian Cafe experience doesn't just include food: our full bar has been serving up award-winning Bloody Marys and the legendary "ManMosa" (crafted with Victorian Cafe private label champagne) for years. This unrivaled breakfast and lunch experience has made "The Vic" a local Bend favorite and "best" of Bend 15 times. "Absolutely amazing. For starters I had the 24oz bloody Mary and it was delicious. The meatball that comes with it was probably one of the best meatballs I've ever had. The entire drink alone could be a meal. But the freshness of vegetables and seasonings in my carnivore omelet, you would be crazy not to order something off of the actual menu. With excelent service to match the food I will definettly be stopping there again my next trip to Bend. " "Unique combination of ingredients that is worth the sometimes 30 min wait for a table. Not a quick in and out. Enjoy the experience!"